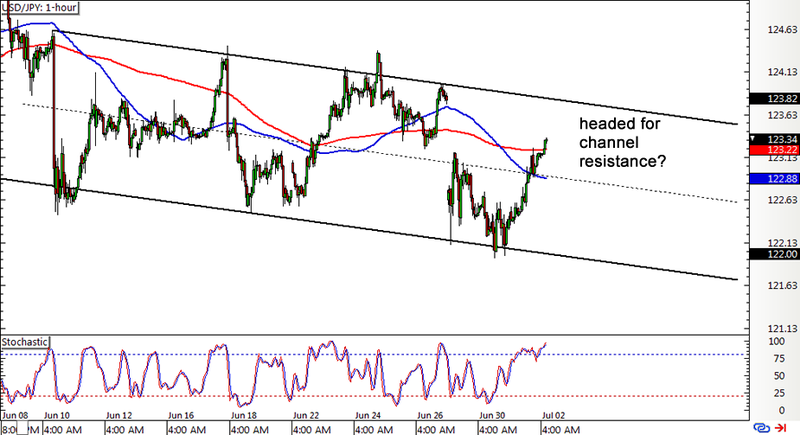 To start off, here’s a simple trend play on USD/JPY’s 1-hour forex chart. The pair has been trading inside a descending channel for the past month and looks ready to test the top of the range around the 123.50 minor psychological level once more. Stochastic is already indicating overbought conditions, which means that buyers are starting to feel exhausted and that sellers could be ready to take over. The 100 SMA has recently crossed below the 200 SMA anyway, suggesting that the downtrend is likely to carry on. If you’re holding out for more confirmation, better wait for reversal candlesticks to form around the top of the channel or for stochastic to start crawling down from the overbought area. Next up is my favorite break-and-retest situation goin’ on in AUD/JPY’s 1-hour forex time frame. The pair previously broke below support at the 95.00 major psychological level then dipped to a low of 92.85 before pulling back up. Price just tested the broken support near the 200 SMA and 61.8% Fibonacci retracement level, which held as resistance, and seems to have its sights set on the previous lows. After all, the 100 SMA is below the 200 SMA, so the drop might just resume. However, stochastic is already in the oversold region and is starting to turn up, hinting that a pop higher might take place. 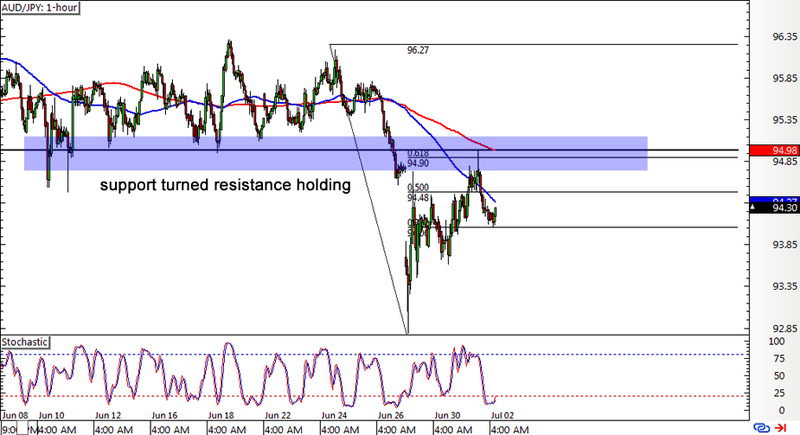 Make sure you set your stops above the 61.8% Fib or 200 SMA if you’re thinking of shorting! 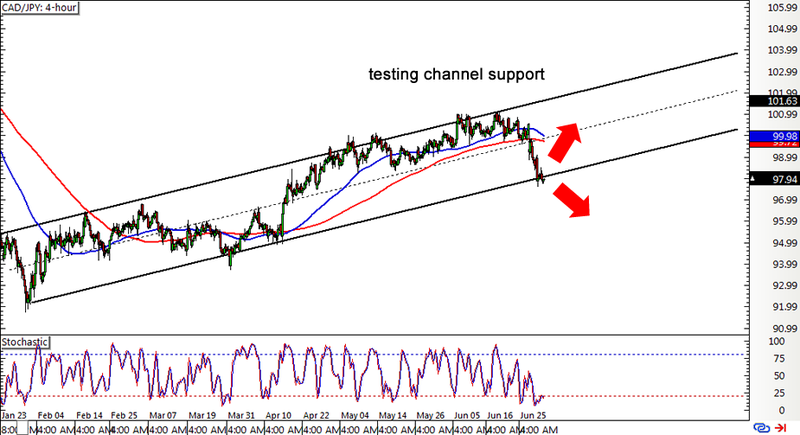 Last but not least is this channel setup on CAD/JPY’s 1-hour forex chart. The pair is currently testing the channel support at the 98.00 major psychological level, still deciding whether to make a bounce back to the top or to go for a breakdown. Stochastic is in the oversold area, suggesting that a move back to the channel resistance near the 104.00 major psychological level might be likely. Be careful, though, since the moving averages look ready to make a downward crossover and show that the path of least resistance is to the downside. Watch out for a convincing candle close below the channel support because that could be an early signal for a reversal.